If you are interested in how much current inventory is on the market in Kodiak you can find that information by clicking on the link. High inventory will suggest that homes are sitting on the market for longer. Currently, in this area of Kodiak, homes have a median time of 71 days on the market before they sell. This would suggest that buyers are in a great position to make an aggressive offer on a home. Sellers should make sure to price their home near the market value if they expect to get an offer from one of those interested buyers. 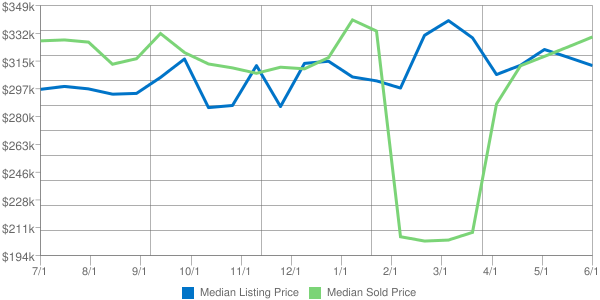 Low inventory in Kodiak has multiple offers coming in on homes similar to what we saw back in 2007. I wouldn’t expect home prices to run up quite as fast as they did back then as banks have gotten a lot stricter on lending guidelines and are no longer giving a loan to anyone with a pulse. But low inventory is one indicator that prices should continue to rise. The median list price in July for single family homes in Kodiak (99615) is $326,800. The list prices decreased from the previous month. Understand the difference between “listing prices” (what sellers are asking for) and “sold prices” (what buyers are willing to pay). By comparing these price trends, you’ll have a good idea of where the market is heading. 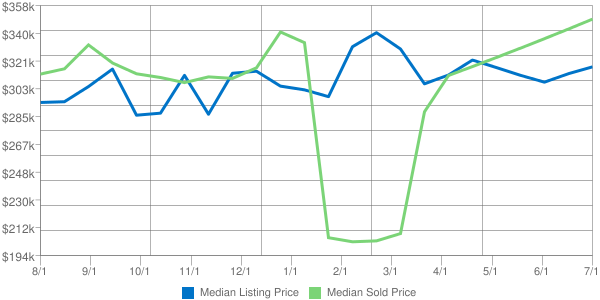 The median listing and sold property prices are calculated based on the market activity each month. Thank you for reading about Home Prices in Kodiak AK for July 2017.